We were thrilled when revered interior designer Neale Whitaker and his Queensland designer Luisa Klinge of Arki Haus opted to use our handcrafted pieces in the new season premiere of Love it or List It Australia on Foxtel’s Lifestyle Channel. When transforming Paul and Michelle’s three-bedroom family home in Boondall, Brisbane, Neale and his team used two Concrete Nation Arc Basins in Mint for the luxe coastal ensuite as well as tiles from our friends and fellow Gold Coast supplier Three Balls Red and tapwear from ABI. “The mint was chosen to reflect the coastal style that the homeowners Paul and Michelle adore,” Klinge told Concrete Nation. “They own an Aquabumps Print, this gave Neale and I the inspiration for this home’s renovation; a relaxed coastal luxe style with sandy, white and grey tones with a touch of minty/aqua green to reflect the water in the print. The vanity basins and the front door were purposely done in these colours and throughout the furniture styling pieces and decor. 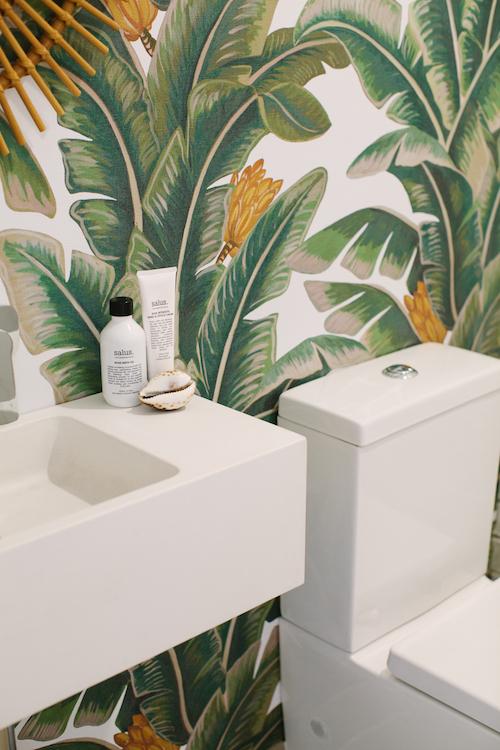 Our Pod Basin was the perfect addition to a new powder room and worked back perfectly with the tropical banana leaf wallpaper from Affordable Decorators. The final result was a revamped tropical beach house that the owners decided to love, not list - sorry Andrew Winter! - and we can see why. Take a tour of the refurbished pad below. Images courtesy of Arki Haus.